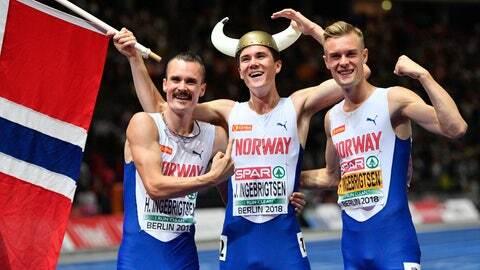 BERLIN (AP) — Following in the footsteps of his older brothers, 17-year-old Jakob Ingebrigtsen of Norway became the youngest winner of the European Athletics Championships men’s 1500 meters on Friday. Filip, the defending champion, and Henrik, the 2012 winner, tried to make it a family sweep of the medals but were pipped to silver and bronze by Poland’s Marcin Lewandowski and Britain’s Jake Wightman, respectively. In another race featuring brothers at Berlin’s Olympic Stadium, Britain’s Matthew Hudson-Smith won the 400 from Belgium’s Borlee twins, Kevin and Jonathan, who took silver and bronze, respectively. Christin Hussong delighted the home fans by starting with a championship-record 67.9 meters in the javelin, effectively sealing Germany’s third gold with her first throw. Pascal Martinot-Lagarde of France edged Russian rival Sergey Shubenkov in a photo finish to win the men’s 110-meter hurdles in 13.17 seconds. Spain’s Orlando Ortega took bronze. Lea Sprunger of Switzerland turned 2016 bronze to gold in the women’s 400 hurdles, while defending champion Nataliya Pryshchepa of Ukraine won the women’s 800. World and Olympic champion Nafissatou Thiam of Belgium won the women’s hepathlon ahead of Britain’s Katarina Johnson-Thompson and Germany’s Carolin Schaefer. Schaefer sent best wishes to team-mates Louisa Grauvogel and Mareike Arndt, who missed the 800 – the last event out of seven – after their earlier involvement in a car crash on the way back to the team hotel. Russian high-jumper Mariya Lasitskene cleared 2 meters to win the women’s competition ahead of Bulgaria’s Mirela Demireva. Germany’s Marie-Laurence Jungfleisch appeared happiest with her bronze, however. “To win it here in Berlin is a dream,” Jungfleisch said of her first international medal. Paraskevi Papahristou of Greece claimed gold in the women’s triple jump.